Having just returned from the Versailles, Indiana Pumpkin Show where I saw a record-breaking 920 pound pumpkin, I’m in the mood for Halloween. I just love Halloween! The jack-o-lanterns, black cats, scarecrows, spiders, ghosts, and tombstones are so much fun. The fun hasn’t been lost on Southwestern American Indian artists either, for I’ve always made a special effort to find Native American jewelry and other art that depict Halloween themes, and I’ve never been disappointed. Therefore, in this month’s featured artist section, I’ve decided to share with you my enthusiasm for some of the American Indian artists who are creating Halloween art. In the past, I’ve collected Native American artwork with Halloween themes from all over the Southwest and in multiple forms as well including a Cochiti pottery witch, Navajo rugs and throws with wicked witches, and, of course, Navajo and Zuni jewelry with ghosts, goblins, bats, moons, tombstones, scarecrows... the list goes on and on. The level of creativity and artistry in these wonderful pieces always amazes me, but what stands out the most is the incredible sense of humor possessed by the Native artists who created each of these. 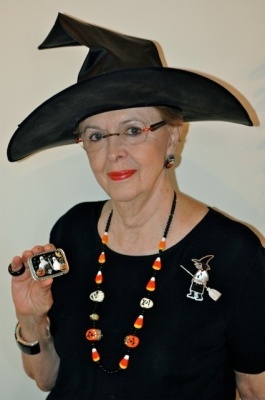 Be sure and check out Dale Edaakie’s “Wicked Witch of the Southwest” pin (complete with cowboy boots and a Kokopelli tee shirt) for a great example – such workmanship and so very funny! Almost all of the artwork in this collection happens to come out of Zuni, New Mexico, but it’s certainly not limited to only Zuni jewelry. I have some really, really good Zuni beadwork in the Halloween genre too – look at the detail on Lorena Laahty’s scarecrow. Besides the jewelry and beadwork are, of course, some great Zuni fetishes – not entirely Halloween in scope, but oh, so perfect for the holiday – can you imagine Ricky Laahty’s frog perched by a candy bowl full of some ominous candy corn! The one non-Zuni Halloween item I have happens to be a silver cat pin with garnet eyes by none other than Navajo Darrell Jumbo. I hope you have a happy Halloween, and I hope you enjoy perusing my American Indian Halloween display.